At present, our company has expanded into Europe and Japan through franchise developments of our toothbrush specialty store "Megadent" while also serving as a retailer in these areas. 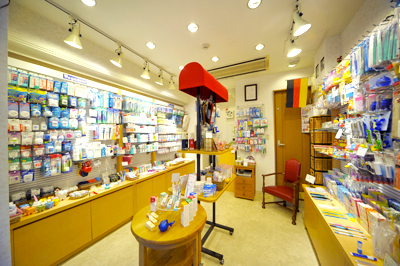 In 2008 we formed the official Japanese arm of our company and launched our online store, before opening our company store "Megadent Ginza" in Ginza, Tokyo in February 2009 as Japan's first store devoted exclusively to oral care. In Europe and Japan, our company stands a pioneer in the field of oral care, offering more than 1,000 kinds of professionally used, high-quality dental products and original oral care goods, as well as products for general consumers via local outlet stores. In addition to sales to general consumers, we are also engaged in the import of our highly specialized, in-house developed "MEGADENT JONY" line and unique European-made products in order to provide wholesale nationwide to major retail stores such as drug stores and home centers, as well as dental offices. Deflogrip Gerhard Reeg GmbH, the parent company of Megadent Japan, was established in 1994 at Dusseldorf, Germany, as an oral care specialized wholesale distributor providing local drug stores and dental offices with oral care products made in European countries, particularly Northern and Southern Europe and in the U.S. In doing so, it became clear that despite awareness of the importance of oral care itself, consumers had not been informed of product information accurately enough to determine what kind of oral care goods would be best suited to them. Another issue of concern was that many dental professionals lacked an adequate understanding of the proper use, features, and distinctions of dental products. In response to these conditions, in 1997 our company decided to open its first oral care specialty shop "Megadent" in Dusseldorf, based on the corporate philosophy aiming to provide as many people as possible with accurate information about oral care goods, delivering high quality products directly to customers so that they can make easy use of the products. This novel approach of the company was highly welcomed by people in Dusseldorf and drew much attention there, showing continued growth. Currently our company has spread its franchise across Europe, having established a total of 8 Megadent retail stores, including company stores. Copyright(C)2010 MEGADENT.JAPAN Co., Ltd All rights reserved.